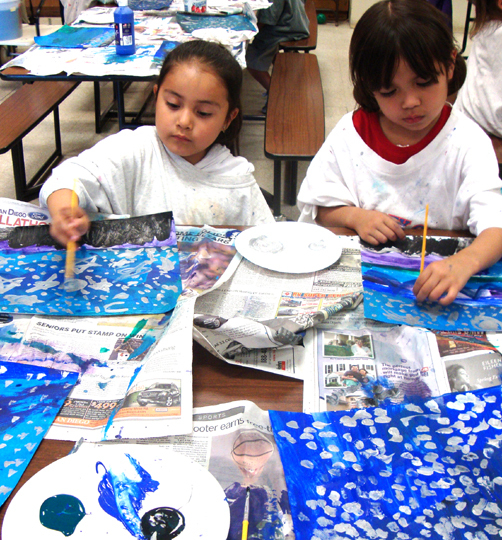 In 2005 through collaboration between the Borrego Art Institute and the Borrego Springs Unified School District, the Children’s After School Art Program was born. In those early days the average class of about 12 students was bused from the school to the Art Institute. 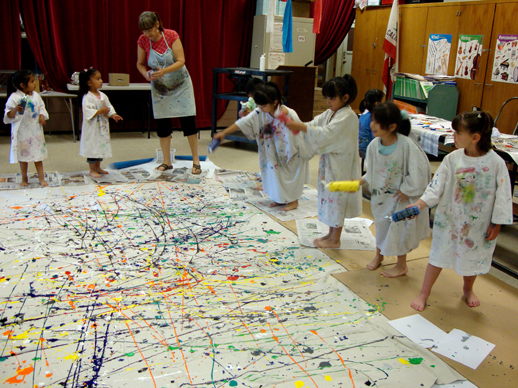 In its second year the program was taken over by local artist and educator Leslie Duncan. As the program’s popularity and numbers grew, the sessions were moved to the elementary school cafeteria and, eventually, to a classroom which it currently shares with the music program. 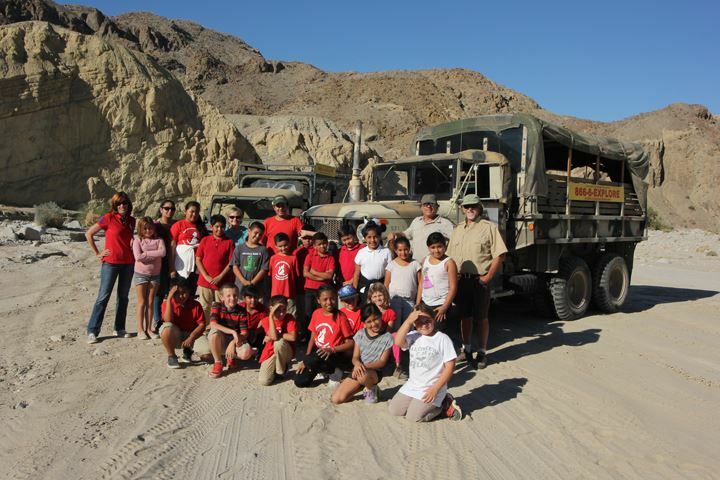 In 2014 the funding was provided by a private donor enabling the program to expand into the regular school day. 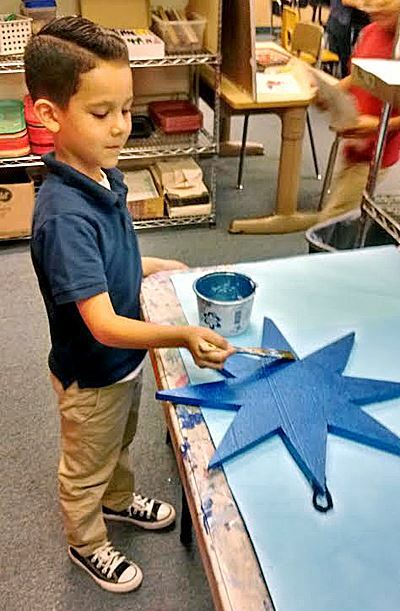 For the first time in many years, every child, grades Kindergarten through 5th (roughly 225) was given a full period of art education and experience each week of the school year. Our Developmental Art Program is geared toward accumulating skills and awareness that will be important to future academic accomplishments. It encourages free expression within boundaries of the materials provided. 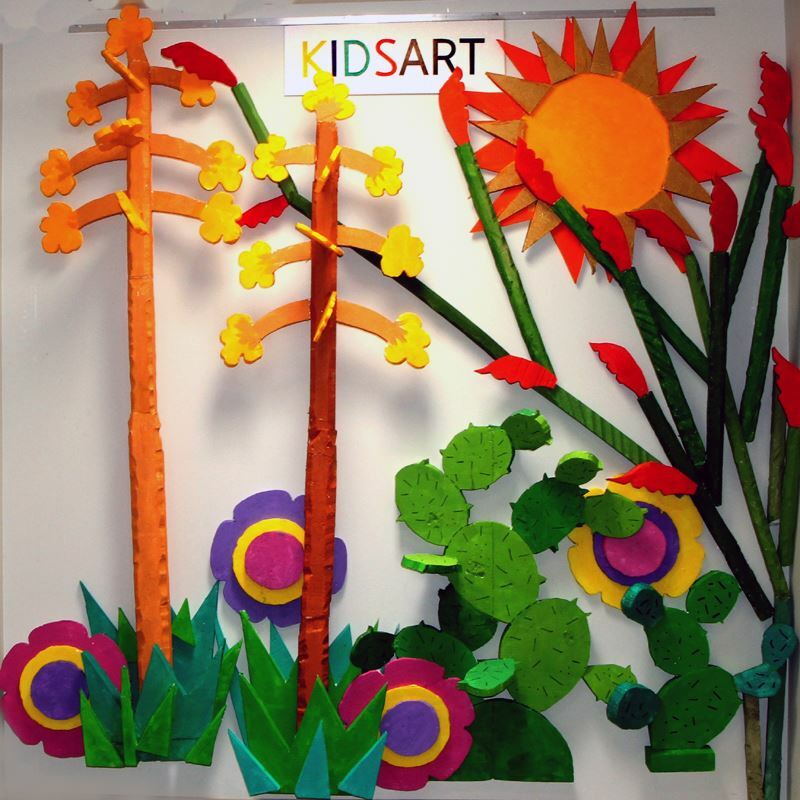 The children are taught the basic art elements, even at the youngest level; they are encouraged to explore various possibilities and to make their own choices. It is an entirely non-competitive activity which helps children discover that the choices they make determine the results produced. Many individuals have flourished in these art sessions in spite of difficulties in other aspects of school and/or language restrictions. 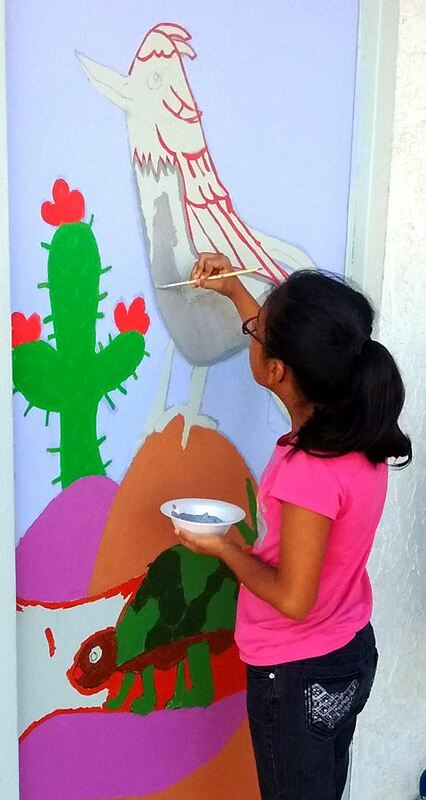 Since 2006 when BAI KidsArt director and teacher Leslie Duncan was asked to decorate the stage for the Miss Borrego Pageant through the After-School Art program, Leslie and the kids have stepped up every year to add that something extra special to the Pageant. 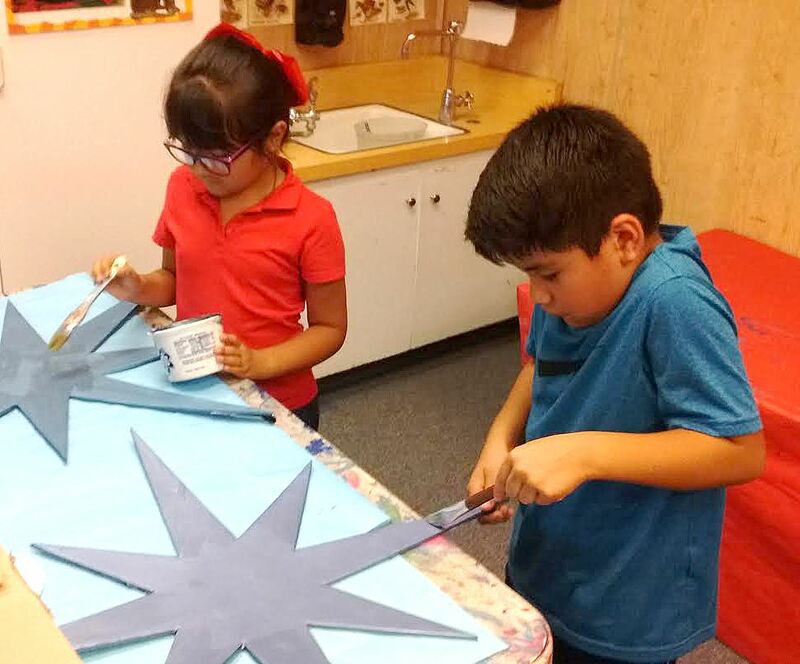 Over the summer, Leslie designs the decor according to the annual Borrego Days theme and stocks the materials, cuts and shapes the pieces, takes them to the elementary school in the fall to be painted, glittered, and finished by the 3rd, 4th and 5th grade students. This year the students are doing metallic painted and glittery stars, shooting stars, and leaping coyotes in silver, blue and purple with the archway covered in clouds of silvery taffeta and hundreds of mini-lights. 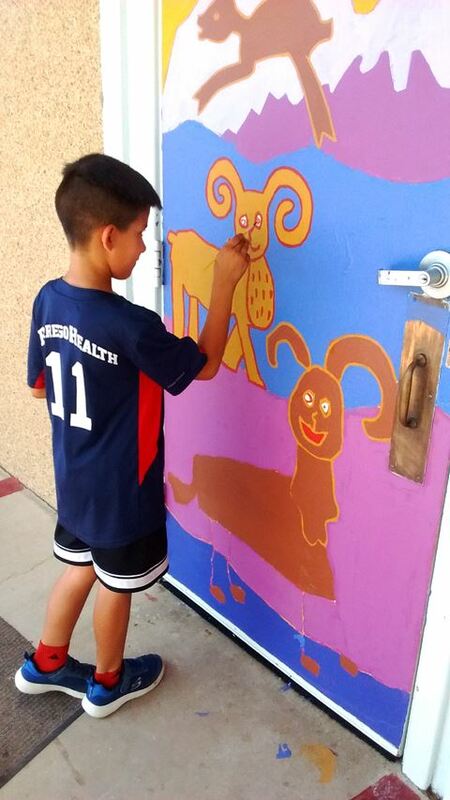 Door Mural Project at Elementary School teaches kids a way to contribute to their community. In the fall of 2016, after the elementary school buildings were repainted, Principal Sherrilynn Polanco called together art teacher Leslie Duncan and first grade teacher Nga Sandhu to come up with a plan to brighten up the exterior and courtyard of the school. And so began the Door Mural Project. Duncan had the students create pencil drawings of desert living elements which were enlarged and transferred to the door surface then painted. As the 2018 school year slipped into summer, seven doors have been completed with three more planned for the fall. An exciting aspect of our program for three years was the inclusion of the Photography Workshop for selected 4th and 5th grade students. Instructed by professional photographer Kay Levie, the children were provided with cameras and equipment provided through a grant from the National Endowment For the Arts. 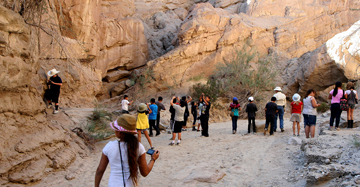 Instructed on how to think creatively and to capture their vision digitally, the students were then taken on a field trip to the Anza-Borrego Desert State Park where they photograph whatever subjects capture their imagination. 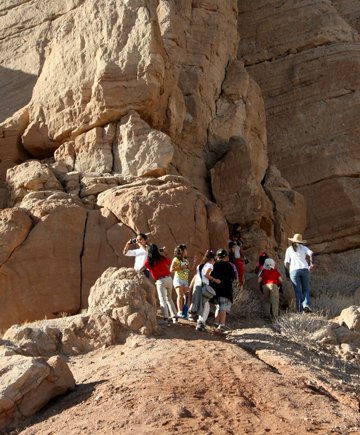 The best work from each student was then entered into the annual Anza Borrego Foundation Photo Contest with the BAI students capturing top awards each year in the youth division.